1 The golden rule when using Tepe Interdental Brushes is DON’T PUSH. If you notice resistance on the brush when attempting to use the brush in the interdental space, STOP and draw the brush back and then try another angle. The resistance you are feeling may not be that the brush is too big (especially if your Hygienist has recommended a size to you) it may be that you are encountering the sides of the tooth rather than gliding through the space. Keep trying another angle if the brush still does not fit try a smaller size. 2 Your brush should be a snug fit so that it touches each side of the triangular shaped interdental space. If it feels to tight try a size smaller. Tepe have now introduced a pack of brushes that contains one of each size. This might be useful to you if you are having difficulty in using your brushes as it will enable you to find the exact right size for the space that you are having difficulty with. EACH INTERDENTAL GAP IS UNIQUE AND SO YOU WILL ALMOST CERTAINLY NEED SEVERAL SIZES OF INTERDENTAL BRUSH TO ENABLE YOU TO DO A THOUROUGH CLEAN OF ALL INTERDENTAL SPACES. 3 Once through the interdental gap only move the brush hoziontally. Try to feel the brush on the gum between the teeth and keep the brush on the gum possibly with a little downward pressure if you are trying to improve some inflammation. Only move the brush back and forth a couple of times. Scrubbing is not necessary and will shorten the life of the brush. If you have moved the brush upwards and it is sticking where the teeth touch each other (called the “contact point”) it is a sign that you have not maintained the horizontal approach. Interdental brushes are not like floss they do not go up and down the side of the tooth, they just clean the area of tooth that is adjacent to the gum as it is here that the inflammation of the gum tissue starts. 4 Put a gentle curve in a brush to clean the back teeth. Then only use that brush on the back teeth and use another straight one for the front teeth. Do not bend the brush back again. Continuous bending may lead to a fracture of the wire which could cause injury. 5 You may notice over time that the brush feels less snug in the space. This is a sign that you have reduced the swelling that is part of the inflammatory process, reducing the swelling means that the inflammation is improving. The interdental brush has not made the gap in between any larger than it was but the swelling may have filled the space. 6 Remember the space in between your teeth is inaccessible to your ordinary toothbrush and although even on the largest teeth it may not be more than a few millimetres long once infection has become established there it can spread down the side of the tooth until it reaches the tip of the tooth root. It will take the bone level with it which is how loose teeth happen. 7 Gum tissue will always respond to care it is never to late to improve a gum condition unless the tooth has already been lost! 8 If you are using a therapeutic gel put it on the gum between the teeth and then use your brush. If you are using the right size brush putting the gel on the brush means that the gel will be removed from the brush before it gets to the deepest part of the interdental space. Toothpaste is unnecessary on an interdental brush. 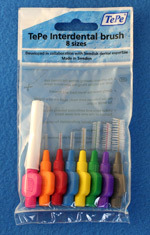 9 TePe Interdental Brushes are designed to be gentle. This means that they are designed to bend before they can penetrate gum tissue. This is why getting the technique right is so important. It is costly and frustrating to keep inappropriately bending the brushes. Ask your Hygienist if you are in doubt or e.mail a question to us. 10 It is universally acknowledged that it is necessary to clean your mouth with a toothbrush every day to maintain health. This is also true of the interdental space. Once or twice a week will not get the results that you would like. 11 Not all Interdental brushes have plastic coated wire. This is particularly important if you have implants as without the plastic covering the wire will scratch the implant. It is important not to scratch the implant as this gives small bacteria an extra place to live. 12 When you have used the brush wash it carefully using your fingers up and down the bristles. Then leave to dry in a clean place. 13 Sometimes it is easier if you slide the brush gently along the gum margin and then the curve of the brush will find it easier to access the interdental space. 14 Interdental brushes are more effective than floss if they are the correct fit. This is because Floss cannot clean a concave hollow in the tooth while interdental brushes can.